Herzog & de Meuron's latest project, 56 Leonard Street in New York City has reached completion, bringing a new high-rise luxury residential skyscraper to the New York Skyline. Measuring to be the tallest tower in the Tribeca neighbourhood, 56 Leonard's architecture was conceived as a stack of individual houses, where each house is unique and identifiable within the overall stack. 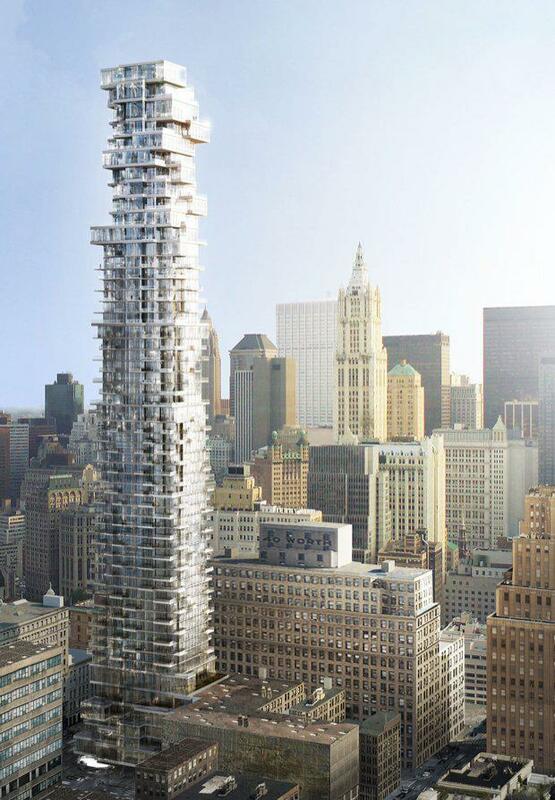 According to Archdaily, design and planning of 56 Leonard started in 2006, with construction starting in 2008. The project was delayed when its developer Alexico Group was hit by the recession and failed to cover the tower’s costs. Work picked up again in 2012 and was anticipated to finalise by 2016. To break-up the tendency towards repetition and anonymity in high-rise buildings, 56 Leonard Street was developed from the inside-out. The project began with individual rooms, treating them as “pixels” grouped together on a floor-by-floor basis. These pixels come together to directly inform the shape which closely resembles a giant Jenga tower. With 145 residences, 56 Leonard features window walls of up to 14 feet and private outdoor spaces in each residence reveal breathtaking views of the cityscape, rivers, bridges and beyond. The building also contains a 75-foot, two-lane infinity-edge lap pool and an adjoining landscaped outdoor sundeck and spa cantilevered 25 feet over Leonard Street for spectacular views. Other features include its 25-seat indoor/outdoor theatre with reclining seats and a terrace, a children’s activity space, a private dining room with an adjacent catering kitchen and a library lounge. The library lounge includes a custom-designed polished stainless steel fireplace and an expansive private terrace and access to the screening room and private dining room. 56 Leonard is located at the intersection of Church and Leonard streets in TriBeCa, which has appealed to a local and global audience because of its culture and history and shops and restaurants. 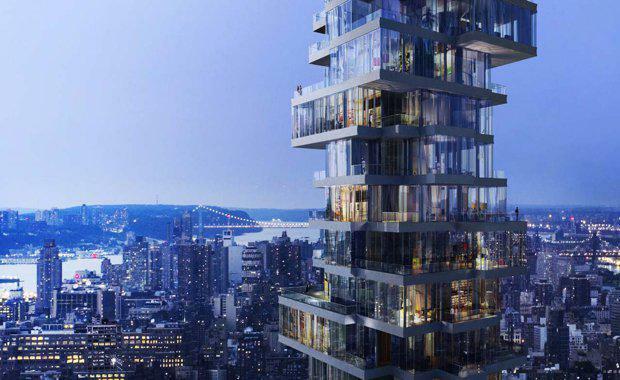 "56 Leonard’s neighbourhood offerings are coveted: internationally acclaimed restaurants, year-round festivals and events and verdant riverside parks," Herzog & de Meuron said. "TriBeCa’s famously rich architectural setting, destination galleries, museums and public art make it the cultural focal point of lower Manhattan."